After our most wonderful experiences, outlined in Anne’s blog entry ‘An insight into Armish life’ we find ourselves contemplating the end of this amazing journey. Suddenly dates and places that seemed so distant a short time ago can be seen appearing as dots on the horizon. Civilisation will be crowding in on us as we leave the open spaces of the west behind and head east, a reminder of the lifestyle changes we will face when we turn Streak and Storms engines off for the last time next month. With our initial transition being to visiting family and friends in Europe, we will have time to contemplate our 15 months on the road and how those experiences will weave their way into the fabric of our lives going forward. Enough of the contemplation, we have another three weeks of sights, sound and experiences ahead to enjoy and record for our loyal followers around the world. We have no specific destination apart from New York at the end of August, and are almost taking a day to day approach to finding the next destination. 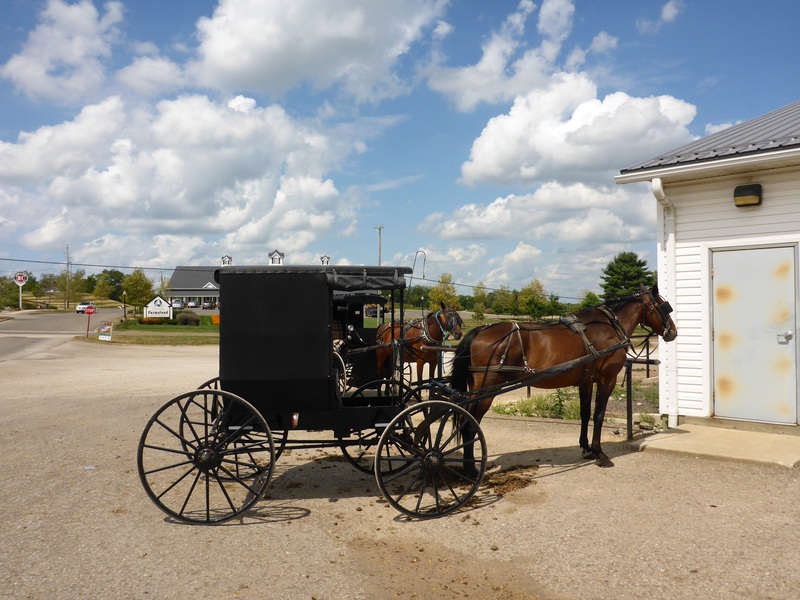 We arrived in the Amish country in Indiana, Anne also wanted to visit some of the Amish communities in Ohio as well so we are headed for Wooster, Ohio. 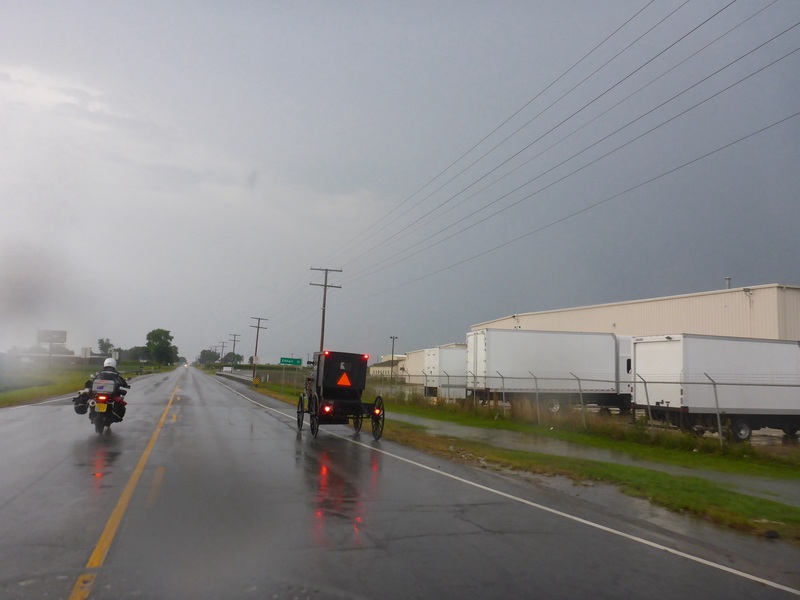 With a 100 mile wide rain front just starting to tap on our windscreens as we rode out of Elkhart along Interstate 88/90, we happily emerge out of the grey drizzle into the bright sunshine and on our way. 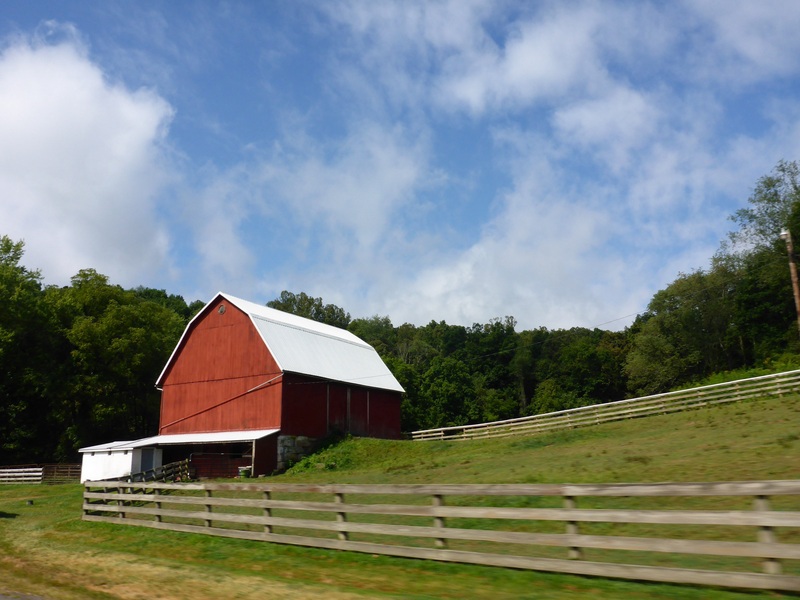 Barns, the red variety, and buggies have been the focus of Anne’s photography this last couple of days. 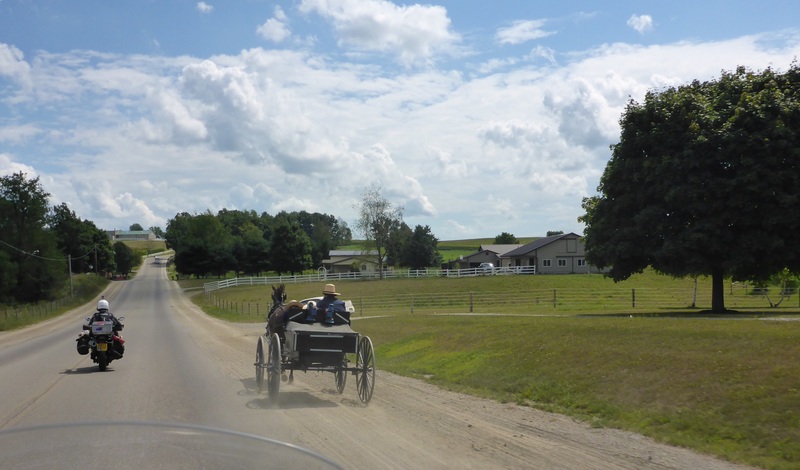 We can tell when we are in Amish country from the horse droppings on the road, an early warning system for buggies around the corner or over the hill. The terrain is quite undulating. Here is a sample of what we saw, the visual representation is far better than any words I can write. 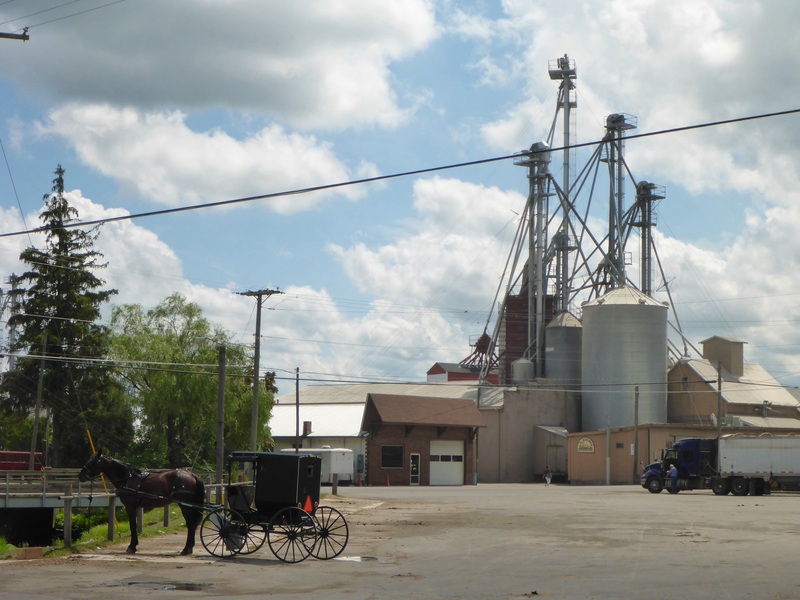 Lehmans of Kidron, Ohio https://www.lehmans.com is a country store in a tiny village that carries a range of Amish made and used products. 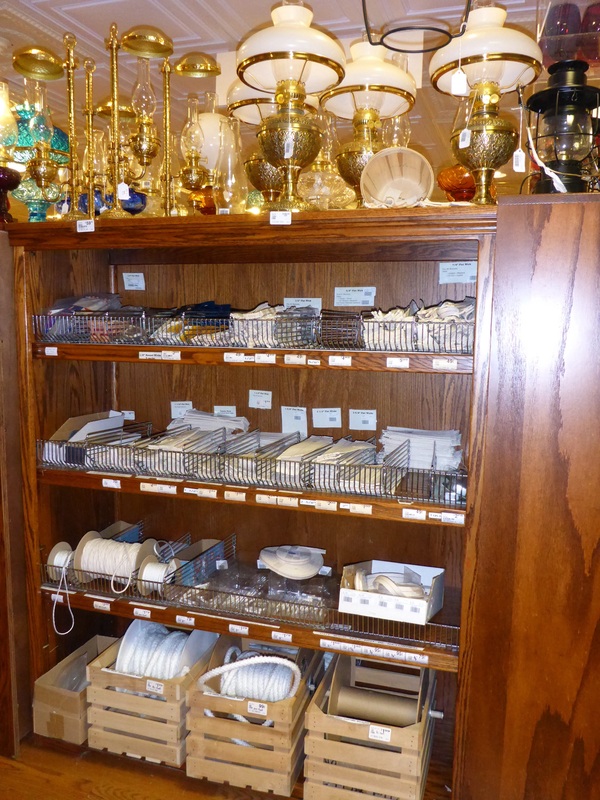 Their byline is ‘Simple Products for a Simpler Life’ and the range of products, their simplicity, the use of local and US manufacturing, plus the interweaving of historical items in the displays makes for a fascinating store, being used by Amish and tourists alike. It is worth visiting if you are in the area. Athens is also a university town and full of parents taking their kids with all their possessions for a new academic year, starting next week. We will have to remember that all the school zone speed restriction signs and school bus rules apply from Monday. 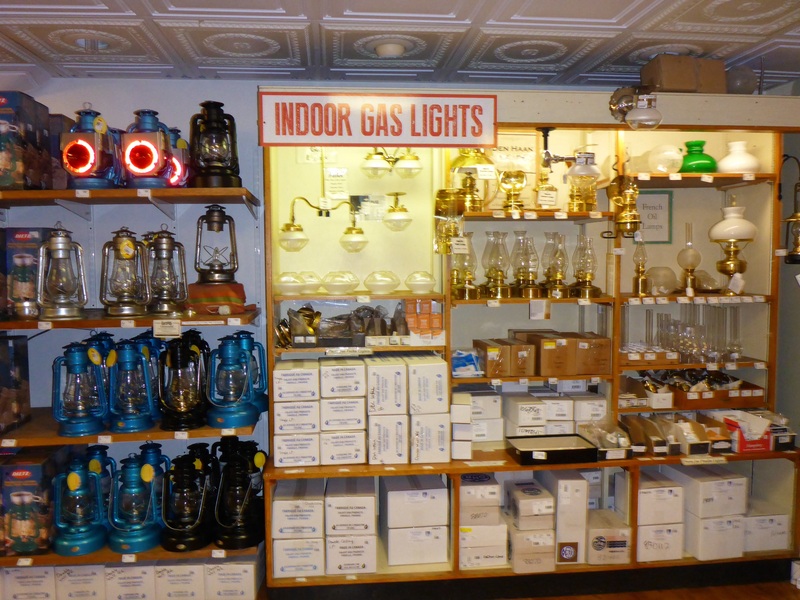 We had stopped for a night in Marietta Ohio, initially for one night, but after talking to an enthusiastic visitor we decide to spend an extra day here. A river bikeway leads us from our hotel next to the Ohio River and Interstate 77 to a beautiful town centre. Unlike so many places we have passed through, this town centre seems alive. It may be because a 2,000 student college provides the economic impetus for redevelopment. We enjoy coffee, a middle eastern lunch at great resturant and the annual flu jab to round off a great day. 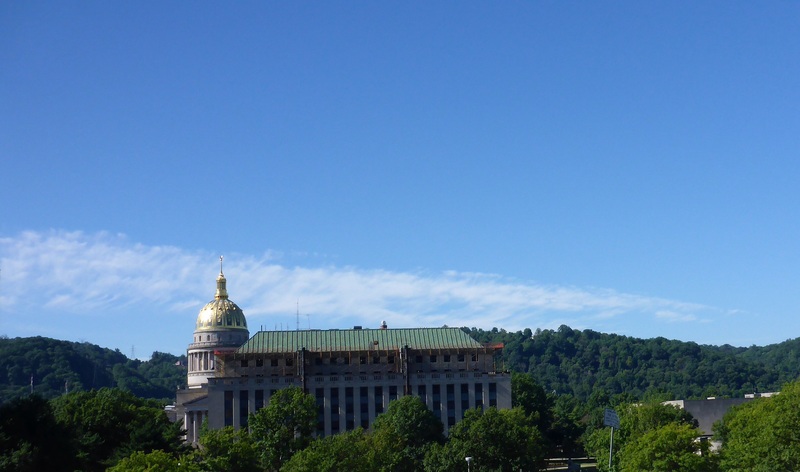 Interstate 77 takes one on a winding journey for over 80 miles towards the Capital of West Virginia, Charleston with its golden dome State Capitol Building. The morning sun falls on the large variety of trees that line the highway and surrounding hills. This must make for a fabulous journey in the Autumn/Fall. When this region was being explored and developed in the early 1800’s, access would have only been possible by river. 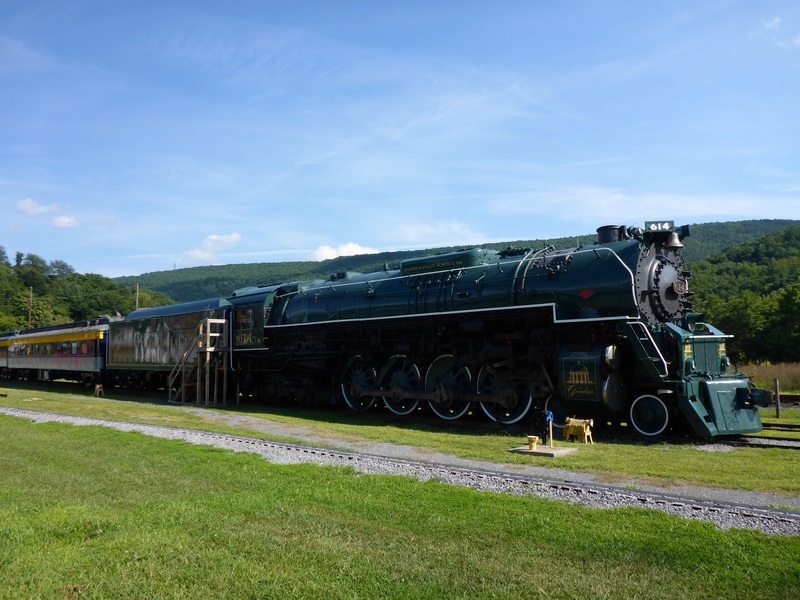 Even today, all economic activity we saw in West Virginia seems to take place along the rivers – road and rail have to follow the river’s course. 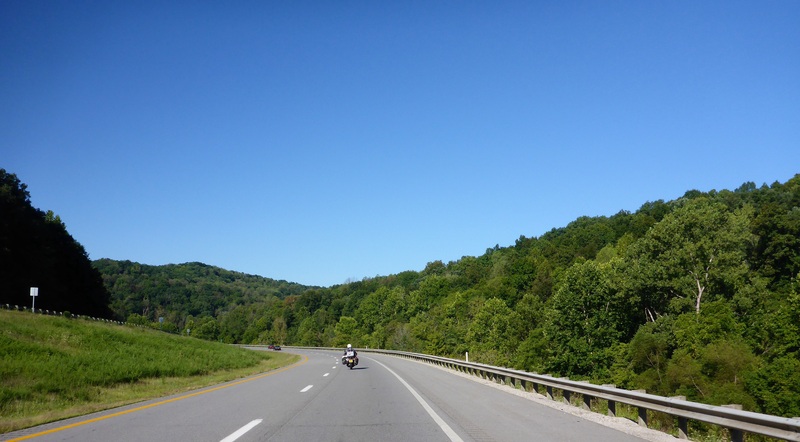 We diverge from the Interstate after Charleston onto route US60 which initially follows the course of the Kanawha River. 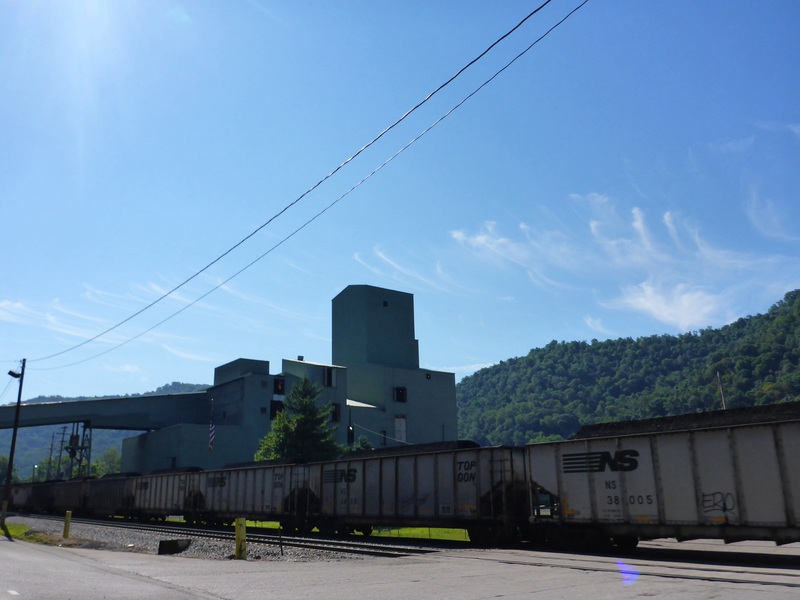 We pass a mile long chemical plant at Belle, a shuttered power station and both open and closed coal mines all clinging to the slivers of flat land between river and heavily wooded hills. 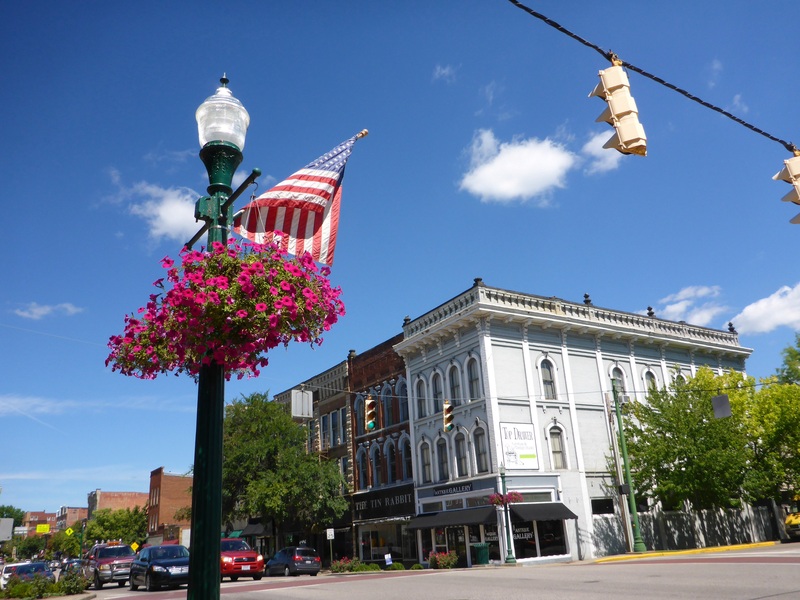 Some of these once prosperous towns seem to have an air of sadness about them, pressure on reducing greenhouse gas emissions, increased natural gas usage for power generation is reducing coal demand which is the major economic activity here. Tough times. 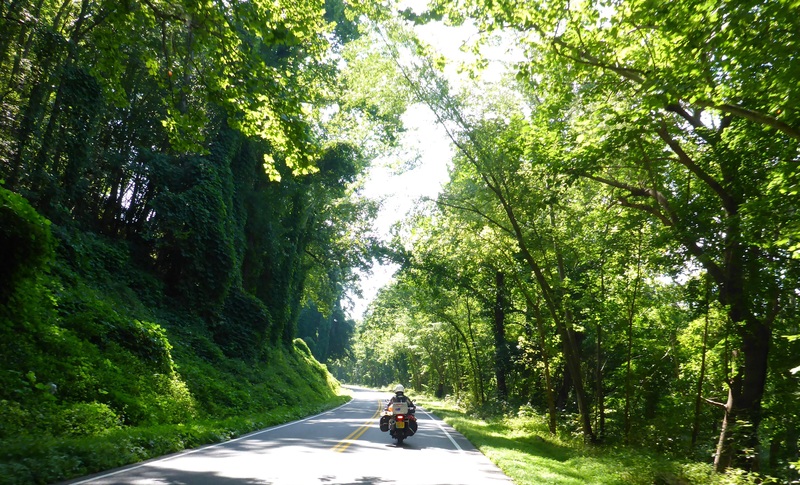 US60 rocks and rolls, brakes and throttle, an edgy twisty road, so much fun even at the slow speeds pace. The scenery reminds me of SE Asia, the density, thick green ivy and I thought at one point we were back at the Golden Rock in Myanmar, but no just a golden ‘M’ arch poking through above the tree line. Appomattox, a name those familiar with the American Civil War will recognise, was the place where Confederate General Robert E. Lee surrendered the Army of North Virginia to General Ulysses S. Grant in April 1865. 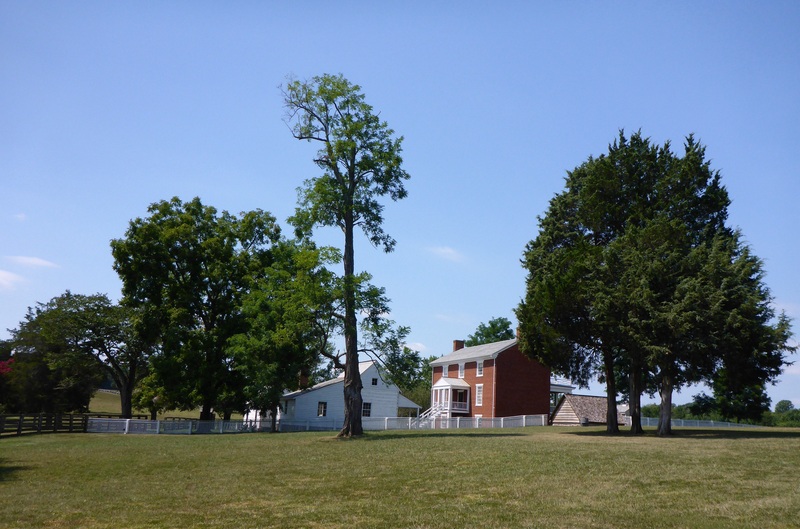 The location of the surrender is now the Appomattox Court House National Park Monument. Buildings have been rebuilt or restored, recreating the location as it was in 1865, although we were told more trees exist today, mostly to screen out modern constructions. The surrounding land used was used for tobacco farming. Reading the history of the event in the museum, one gained a sense of two men who by the outcome of the terms of surrender, helped lay the foundations for reconciliation over time between North and South. One of the more interesting aspects of being in the USA at this time is vey early campaigning, Republican and Democrat Presidential candidates, given the first primary elections are not till February 2016. This is our daily diet of TV, interspersed with all the USA crime program series to allow me to catch up in what I have missed over the last 24 months. Yes I can be a TV junkie. First impressions are of a busload of Republicans competing on the one hand, and Hilary and her ‘baggage’ on the other bus, although her bus may take on extra passengers (candidates) should the baggage slow the bus down too much. On the republican side Donald Trump has taken the limelight as he always does, uses non politically correct language and raises issues such as illegal immigration that politicians want to ‘manage’ the message in their usual way. His approach has gone down well with a portion of the population fed up with ‘Real Politicians’ , but I suspect over time his approach will see his vote stagnate and as other republican candidates fall beside the wayside those supporters will not move to Donald Trump. I am glad I do not have to sit through this interminable election process in the USA, I just hope the process turns up a good couple of candidates to enable a good President to be elected. It was so great to meet you both on I-80 of all places. Your travels are a true inspiration! Great to meet you and your family. That was a quick response to our post. Hope you enjoy the last couple of weeks of the blog. I looked through your splendid photos documenting the fantastic adventure, who would have thought that you would encounter such a wonderful human variety! It must be hard not to think about the tick tock of the clock as you move closer to the end, try to forget the clock and relish the time left. Your blogs have become part of the lives of others so we can share the count down with you. Its a wonderful world, full of great people. We will enjoy the last couple of weeks as this chapter draws to a close. Ours is improving as well. We have been visiting parts of the USA that we have never been to before. Only three weeks to go ? What am I going to do without my regular blog. Maybe you could continue by featuring ‘life after the road’. Cruising along with no particular place to go must be exhilarating, allowing you to spend more time looking at your surroundings. Great narrative and pictures as always. I think you may find a another blog or two to follow. Just make sure to service the armchair before taking it on another journey. We will try and let you down slowly. We have to many rugs at home to get into quilting. We will try to let our followers down slowly with our blog. Hi Anne & Anthony, ambassadors of goodwill – It’s Marte from Yellowstone (Marte,Ed & Annie). Today is like Christmas. We are back home where we have connectivity and I finally get to open up and read all your blogs! You provide such wonderful insight and reflection I feel as though I’ve tagged along on the back of Streak or Storm and I’m seeing the world thru different colored glasses. Thank you, thank you!! FYI Lancaster County, Pennsylvania has many examples of Amish & Mennonite quilting. Take care and Happy Trails! Great to hear from you and glad your enjoyed the blog history. When we stop it will be interesting for us to go back and see what we wrote. Have to be aware of the buggies, they can be around every corner. Harder to ride through the trees as limited views ahead and the forrest is full of animals that may want to cross the road.